I think this is a fantastic idea. Bamboo is one of the world’s fastest-growing plants and this makes it a highly sustainable material. It’s strong (with a similar strength-to-weight ratio to that of steel) and lightweight and would appear to be the perfect material for a bicycle. Imagine if the use of bamboo as a material for transport as caught on in developing countries? A large sector of a population with access to a low-cost, sustainable method of transportation could miraculously transform an economy. 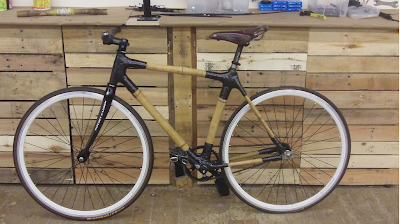 No wonder bamboo bicycles are now being heralded by bikers, environmentalists and social entrepreneurs alike. DIY manuals on how to build bamboo bikes are popping up all over the web and entrepreneurs like The Bamboo Bike Studio are getting in on the act by holding workshops and providing mail-order kits. While bamboo bikes are being considered as essential tools for transport in developing countries, in more developed regions, the emphasis is on street-cred (high-performance bamboo-frame bicycles don’t come cheap ranging from $3,000 for just the frame to $10,000) and design with some frames being treated as a form of art. While they may be strong, my main concern is for their durability. Being produced from natural and biodegradable material must certainly limit the longevity of a bamboo bike, but with material that can be so easily sourced and replaced, perhaps that is a minor consideration.